Fifteen of the most promising new music acts have been named on the BBC's Sound of 2013 longlist. Aimed at showcasing talent for the year ahead, the list was compiled using tips from 213 tastemakers, who each named their favourite three new acts. Soul singer Michael Kiwanuka came out on top last year, with Adele, Jessie J and Ellie Goulding among past winners. The 2013 line-up includes boy-girl pop duo AlunaGeorge, Birmingham indie group Peace and Californian sisters Haim. Other acts tipped for success include all-girl post-punk band Savages, Glasgow electro-pop three-piece Chvrches and London rock quartet Palma Violets, whose debut single Best Of Friends was recently named track of the year by the NME. The Sound of 2013 winner will be announced online and by DJ Huw Stephens on the BBC Radio 1 breakfast show on 4 January. Stephens described this year's list as "exciting and vibrant", with a mixture of strong vocalists, leftfield artists and a number of bands with "their own take on modern pop". "It's always a varied list that surprises people, causes debate and speculation about the state of the music scene," he said. "For me, it's an exciting time of year, where we don't really know what the year will bring with new music, but this helps give people an indication of what might sound good." Several of the acts featured in the top 15 have combined existing genres to come up with something new. Classically-trained songwriter Laura Mvula has been described as a cross between Nina Simone and Bjork, thanks to the combination of her soulful voice and orchestral-style arrangements. The 26-year-old started writing songs on her laptop while working as a supply teacher in a Birmingham secondary school. Haim, who used to sing in a covers band with their parents, fuse Fleetwood Mac's folk-rock riffs to R&B beats more reminiscent of Destiny's Child. And AlunaGeorge, otherwise known as singer Aluna Francis and producer George Reid, have had their soul-influenced electronica dubbed "popstep". Scottish pop trio Chvrches subvert their euphoric pop sound with an undercurrent of melancholy that has seen them compared to 80s pioneers Soft Cell and Depeche Mode. From across the Atlantic, female rapper Angel Haze also makes the list, alongside Canadian R&B singer and producer The Weeknd, otherwise known as Abel Tesfaye, who has worked with rapper Drake. Gary Barlow has already given 17-year-old pop singer A*M*E his seal of approval by signing her to his record label. Real name Amy Kabba, she moved to the UK from Sierra Leone when she was eight years old. Other female singer-songwriters predicted to do well in 2013 include 19-year-old Arlissa, who has already recorded a duet with rapper Nas, but whose solo material is drawing comparisons to Florence and the Machine. Tom Odell, who studied at the Brighton Institute of Modern Music, is representing the male troubadours along with 17-year-old King Krule, whose real name is Archy Marshall. Odell's piano-led songs have already earned him a slot on BBC Two's Later... With Jools Holland, while garage blues singer King Krule attended the the Brit School - which also nurtured Jessie J, Adele and Amy Winehouse. Two Irish bands have made this year's list, in the form of Dublin indie four-piece Kodaline, who are being compared to Coldplay and U2, and country rock band Little Green Cars, who have already supported Mumford and Sons in the US. The tastemakers include critics and music journalists, radio DJs, TV presenters, TV and radio producers, website editors and music bloggers. Each was asked to name their three favourite new acts, who could be from any country and any musical genre. Among them was Wendy Roby, from influential music website Drowned in Sound, who said: "It's easy to be cynical about lists. It's not easy, however, to make brilliant racket like AlunaGeorge, The Weeknd and Savages. "Finding music is all about gateways, connections, finding your own route through. And I think there's enough range on this list for everyone to find something to love. Or maybe just something to kick against, until you find an artist you can't wait to get tattooed on your arm, or whose band T-shirt you'll want to sleep in." The successful acts cannot already be well-known to the UK public, for example through featuring on the final stages of a UK TV talent show or having already been a member of a successful band. They must also not have had a UK top 20 single or album before 11 November 2012. The top five acts will be revealed in reverse order in the week beginning Monday 31 December on BBC Radio 1, the BBC News website and the BBC Sound of 2013 website. Since topping the Sound of 2012 list, Michael Kiwanuka's debut album, Home Again, has reached number four in the UK chart and been nominated for the prestigious Mercury Prize. 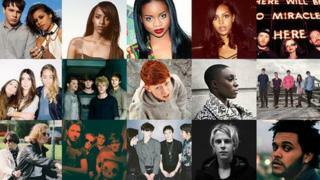 Huw Stephens will host a special show featuring tracks from all 15 acts on the BBC Sound of 2013 longlist from 22:00 GMT on Monday 10 December on BBC Radio 1. A free download - Huw Stephens' Guide to the BBC Sound of 2013 list - will also be available from the Sound of 2013 website afterwards.